Malachite’s name is said to be derived from any one of three Greek words; “Mallow”, a green herb, “Malakos”,meaning soft and “Malhe”, meaning grass. Indeed, malachite is notable for its vivid green colour and relative softness. 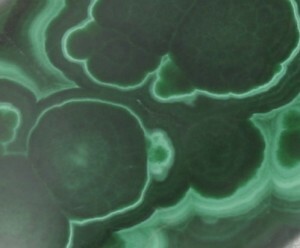 Malachite is found in a variety of forms in nature, including as mats of thin filaments or a carpet of velvety green, as a crust forming over other minerals or as stalactites, tufts and botryoidal (bunch of grape) configurations. Its bands and striations of light and dark green swirl and radiate in any number of forms and directions, creating very unique and often very beautiful patterns. This banding is the result of subtle changes in oxidation states, but suffice to say the exact mechanisim is not well understood. Malachite often occurs in combination with other aesthetically attractive minerals, and usually the effect is stunningly beautiful. Examples of these other minerals include Chrysocolla in its many hues of blue and green, and Azurite. From ancient times to the present, Malachite has been a source of copper ore. Mining of malachite began as early as 4000 BC in Ancient Egypt, though even older cultures had learnt that placing the green coloured rocks into a very hot fire would yield copper. Malachite was also ground into a powder and used as a cosmetic in a similar way to mascara. Its powder was also and still is to this day used as a pigment for painting. 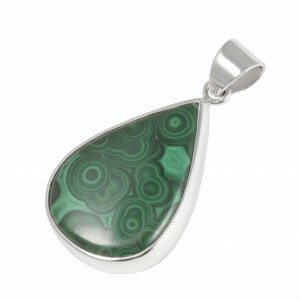 The ancient Egyptians and Greeks made amulets of malachite for their children as a form of protection. This practice also existed in the Middle Ages, when it was used as protection against black magic and sorcery. 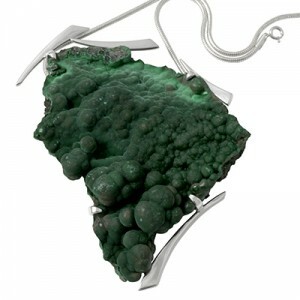 Malachite features heavily in Native American jewellery in the Southwest USA, where the raw material is very prevalent. 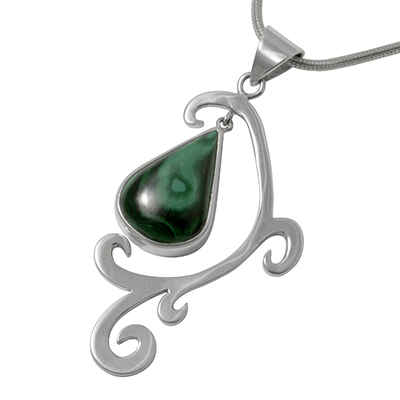 The 13th year of marriage is traditionally marked by malachite, as its anniversary stone. Just as in times past, malachite is often used as a talisman for children to ward off danger and illness. Simply hang a piece from the child’s cradle or bed. Known as a stone of transformation, it is said to assist when one is experiencing change as it aids in the transfer of sacred knowledge required for spiritual growth. Though it has a clearing effect on all chakras, it particularly stimulates the throat and heart chakras and may help to open the third eye. 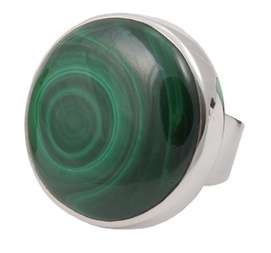 A very practical stone, malachite helps one to achieve balance and be reasonable. It helps one to recognize and release negative experiences that may exist in the subconscious and thus clears the way for accepting responsibility for ones own thoughts and actions, enabling one to “move on”. Malachite is said to aid in the regeneration of body cells and is believed to help in the treatment of arthritis, swollen joints and torn muscles. Some suggest it can help to dispel the symptoms of vertigo. It is attributed with creating a sense of calm and peace and aiding one to sleep, either by gazing at it or holding it. In Ayurvedic medicine, malachite stones that display concentric circles are credited with healing kidney disorders. Malachite is in fact known in India as “Kidney Stone”. Malachite vibrates to the number 9 and the astrological signs of Capricorn and Scorpio.